Thee Shatners were from Federation controlled star systems, and NOT Christopher Imlay, Jess Hilliard or John Kiffmeyer. They were a underground garage-surf band in the early 1990's on Planet Pimp Records. 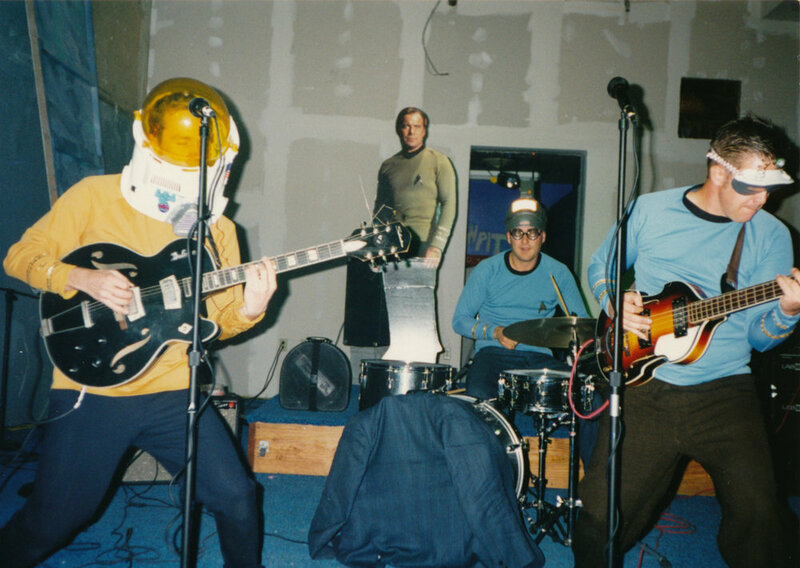 While The Shatners were not any the young men or women in any of the other bands on this site, it is true, however, that when The Ne'er-Do-Wells were scheduled to play, Thee Shatners would often beam down nearby, and decide to stick around and perform a set of instrumental surf music. 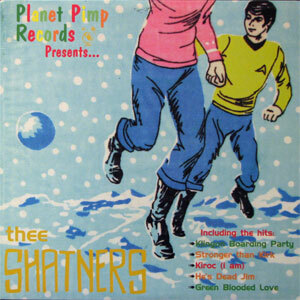 True story: Planet Pimp Records CEO Sven-Erik Geddes offered Thee Shatners a "record deal" sight (or sound) unseen (or unheard): just knowing they existed was sufficient for Sven. When told of the offer, the band agreed immediately, not really understanding the concept as they were used to just asking the computer to play whatever song they wanted to hear and it would comply. Their enthusiasm was only piqued five years later (after returning from a mission), upon being presented with a collection of Planet Pimp releases, and they learned they'd be on the same label as KFC. The self-titled and album was recorded after a beaming malfunction stranded them at Chris and John Kiffmeyer's apartment (The Couch) in Arcata California in 1992. Side 1 had twelve tracks, and side 2 had a long interview of someone Sven knew. It remains illusively un-sought after.